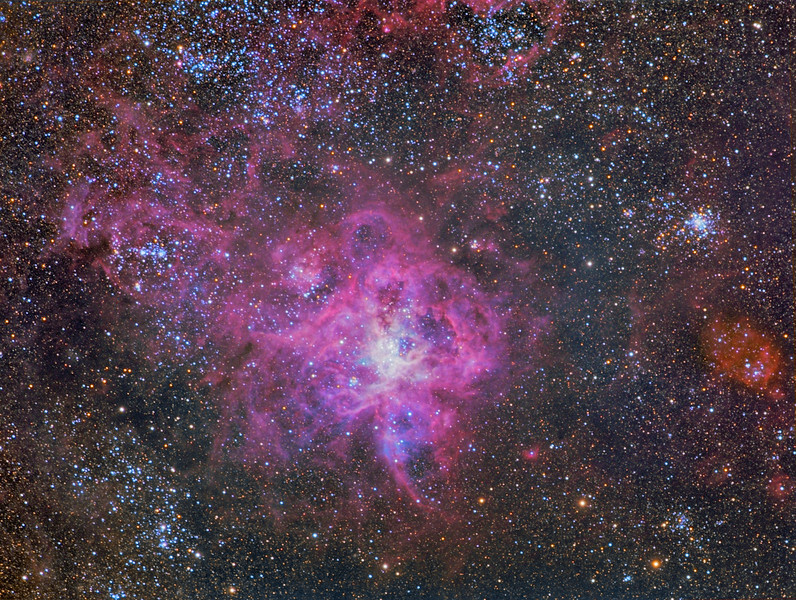 The Tarantula Nebula, named for its appearance that somewhat resembles a giant spider in the sky, is the largest known emission nebula in the Local Group of galaxies. It is about 1000 light years wide and would appear incredibly bright if it were located in the place of the Orion Nebula. It is however located 160,000 light years away in the Large Magellanic Cloud, the largest of the dwarf galaxies that accompany our Milky Way. In the very centre of the nebula lies R136, a super star cluster which is a very large region of star formation thought to be the precursor of a globular cluster. It is a very young cluster at only 1-2 million years and consists of giant and supergiant stars of which the majority are spectral type O3. The cluster also contains several Wolf-Rayet stars. Speculation long sorrounded the nature of the central component of the cluster, named separately as R136a, and it was once thought to be a single hypergiant star of an incredible 1500 solar masses. R136a's true nature was recently resolved by holographic speckle interferometry and found to be a dense star cluster containing very massive and luminous stars. Three extremely luminous stars (R136a1, R136a2 and R136a3) dominate this cluster and are separated by only 0.10 and 0.48 arc seconds. R136a1 is the most massive star found to date with 265 solar masses, as well as being the most luminous at 10 million times the brightness of the Sun. The entire R136 super cluster produces most of the energy that makes the Tarantula Nebula visible. The estimated mass of the cluster is 450,000 solar masses, suggesting it will probably become a globular cluster in the future. A super star cluster, named Westerlund 1, also exists in the Milky Way but is heavily obscured by galactic dust.